An expansion project on the Memorial Union’s west side will allow for more space in the Union Dining Center and a new Upper Level conference room. One of North Dakota State’s most frequented spaces is under construction. The Memorial Union is undergoing a project on its west side to expand seating of the Union Dining Center, as well as opening up windows for natural light on the main level of the building. 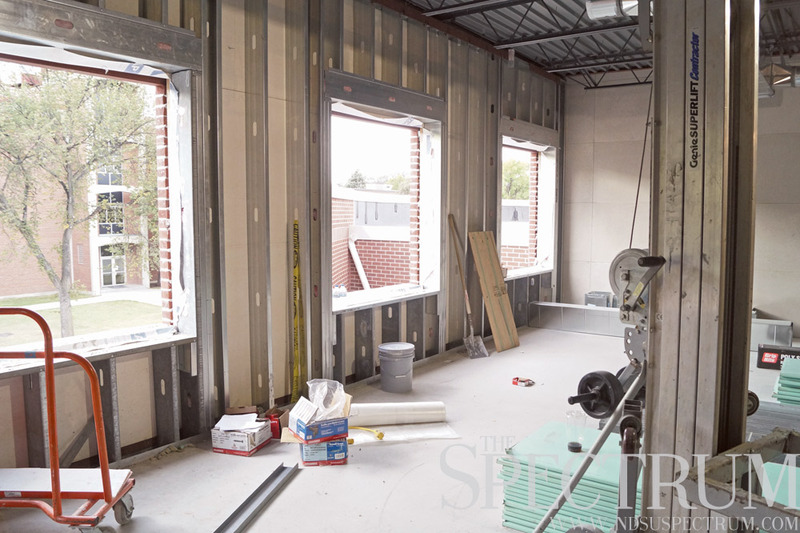 A new conference room will also be added on the third floor, said Paul Wraalstad, associate director for operations and facilities management. Students regularly fill the Union’s chairs and occupy the tables for study purposes. David Strand, a junior majoring in medical laboratory science, said he uses the upper level of the Union to study about three times a week. Katie Gisi, a junior in agricultural and biosystems engineerings, said she uses the area for at least an hour every day. Both Strand and Gisi said they cannot help but be distracted by the plywood boards around the construction site and, as Strand said, how the construction seems to be “shrinking the area” while expanding the project. Wraalstad said the expansion will provide better accessibility to the Union Dining Center’s food line as well as for students to maneuver the area. The main level is going to be open for windows to bring natural light in the dining center. “As a result of that project, we were able to add a third level up on this second floor, and we’re going to have a new conference room,” Wraalstad said. The additional conference room will allow for less difficulty in reserving a room to the different student activities and organizations that take advantage of the setup. The dining center’s expansion is projected to be ready for students at the start of 2016. “(The Union has) to wait until Christmas break to do the final tie-together between the current dining center and the new dining center because they can’t afford to interrupt and close it down,” Wraalstad said. Other projects aimed to improve the Union included a summer project that was completed in partnership with facilities management to reconstruct the ramps that connect the Union and the Family Life Center. On the second level of this ramp, a project is in place to include study pods. These areas will be secluded study spaces consisting of countertop seating as well as soft seating. This project is expected to be completed by mid- to late October. It’s been eight years since the Union carried out a project aimed at improving the quality and comfort of the space. Wraalstad said seven to 10 years is the ideal window “from a wear-and-tear perspective” of when furniture as well as carpet need to be refreshed. “It would be my hope that every year we are replacing 15 to 20 percent of our furniture, so we are constantly keeping up with students’ needs,” he said.